"41AN1-27, Burial E-5" by Timothy K. Perttula and Robert Z. Selden Jr.
DECORATION: The body is decorated with two different engraved motifs. There are eight hatched pendant triangles at the upper part of the body, directly under the neck, and three vertically oriented cross-hatched and rectilinear engraved bands (i.e., wide interlocking scrolls) that begin at the body-neck juncture and extend almost to the vessel base. Hume Engraved, var. 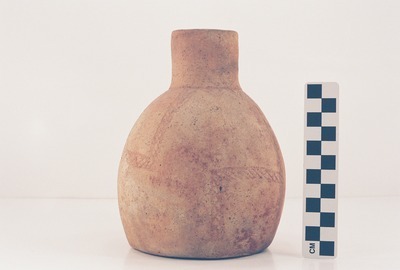 unspecified bottle (Vessel 41AN1-27).